There were 245 press releases posted in the last 24 hours and 153,497 in the last 365 days. Latest research, by GoodFirms publishes the list of Top Social Media Marketing Agencies from worldwide that follows new trends to keep you ahead of competitors. WASHINGTON DC, WASHINGTON, UNITED STATES, April 30, 2018 /EINPresswire.com/ -- In this modern era, social media has become a key to get connected with the right audience for your business. Social media has completely changed the marketing methodology across the worldwide. Therefore, entrepreneurs are in search for top social media marketing companies who can help them drive the customers towards their business. To ease this intimidating job for the business owners and individuals, GoodFirms revealed Top Social Media Agencies globally that provides all sort of excellent SMM services for your business. Social Media Marketing is considered as the most convenient platform to reach a number of customers to help your business grow without spending much on big billboard and TV commercials. Along with social media marketing if you are looking for building your brand, here you can take a glance at the list of Top Branding Agencies at GoodFirms that are serving the businesses to strategize an ingenious new approach to your brand's social footprint. 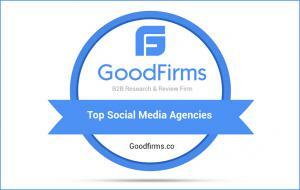 GoodFirms is an internationally B2B research and reviews platform. This firm helps the individuals and entrepreneurs from undergoing the daunting task of searching the best social media companies. Here, GoodFirms fix the problem of service buyers by researching and indexing the list of reliable SEO services provider. The analyst team of GoodFirms demeanors a research process where all the companies have to go through a number of factors. According to these parameters, the research team identifies their quality of work, their ability to work for different types of industries, their market presence in the digital marketing domain, their on-hand experience in social media marketing and their reliability to assist the companies in achieving organizational success with well proven tactics as well as check out their feedbacks given by their patrons to list them in the top social media marketing companies. Here, GoodFirms has sorted out the Top Local SEO Companies for the service seekers who are willing to target the audience from specific location to increase the visibility, boost sales and stay ahead in the competition. Additionally, GoodFirms also helps the service providers by inviting them to take part in the research process with the proven record of successful services and get indexed in the list top SEO Companies for free. GoodFirms is a Washington, D.C. based research firm that aligns its efforts in identifying the most prominent and efficient social media marketing agencies that deliver results to their clients. GoodFirms research is a confluence of new age consumer reference processes and conventional industry-wide review & rankings that help service seekers leap further and multiply their industry-wide value and credibility.